The aggregate market value of voting stock held by non-affiliates of the registrant was approximately $20.1 million on June 30, 2014, based upon the closing price of the registrant’s common stock on The Nasdaq Capital Market on such date, the last trading day of the registrant’s most recently completed second fiscal quarter. Shares of voting stock held by each executive officer and director and by each person who, as of such date, may be deemed to have beneficially owned more than 5% of the outstanding voting stock have been excluded. This determination of affiliate status is not necessarily a conclusive determination of affiliate status for any other purpose. 38,310,196 shares of the registrant’s common stock were outstanding on March 19, 2015. Part III of this Form 10-K incorporates certain information from the Registrant’s definitive proxy statement for its Annual Meeting of Stockholders expected to be held on May 19, 2015. The definitive proxy statement will be filed by the Registrant with the Securities and Exchange Commission no later than 120 days from the end of the Registrant’s fiscal year ended December 29, 2014. Cosi, Inc., a Delaware corporation incorporated on May 15, 1998, owns, operates and franchises fast-casual restaurants which sell high-quality, made-to-order hot and cold sandwiches, hand-tossed salads, bowls, breakfast wraps, Cosi® Squagels®, hot melts, flatbread pizzas, S’mores and other desserts, and a variety of coffees and specialty coffees, along with other soft drink beverages, bottled beverages including premium still and sparkling waters, teas and beer and wine in some locations. Our restaurants are located in a wide range of markets and trade areas, including business districts and residential communities in both urban and suburban locations. We believe that we have created significant brand equity in our markets and that we have demonstrated the appeal of our concept to a wide variety of customers. As of December 29, 2014, there were 111 Company-owned and franchised restaurants operating in 16 states, the District of Columbia, the United Arab Emirates (UAE), and Costa Rica. Our internet website is www.getcosi.com. We make available free-of-charge through our website our annual reports on Form 10-K, quarterly reports on Form 10-Q, current reports on Form 8-K and amendments to those reports filed or furnished pursuant to Section 13(a) of the Securities Exchange Act of 1934, as amended, as soon as reasonably practicable after we electronically file or furnish such materials to the Securities and Exchange Commission (“SEC”). In addition, our internet website includes, among other things, our corporate governance principles, charters of various committees of the Board of Directors, and our code of business conduct and ethics applicable to all employees, officers and directors. Copies of these documents may be obtained free of charge from our internet website. Any stockholder also may obtain copies of these documents, free of charge, by sending a request in writing to: Cosi, Inc., c/o Investor Relations, 294 Washington Street, Suite 510, Boston, Massachusetts 02108. Our goal is to become the preferred fast-casual dining concept nationally. We strive to serve flavorful food prepared quickly, with unparalleled customer service, in a unique, welcoming and sophisticated ambiance. The Cosi® restaurant concept, whose name was inspired by Mozart’s famous opera, Così Fan Tutte, originated in Paris as a Parisian café. We strive to create a romance between our famous, freshly-made bread, our barista-crafted coffees and specialty drinks, and our loyal guests. Offering a creative menu featuring a combination of both healthy alternatives and edgy options. Our restaurants offer innovative, freshly made-to-order products featuring our authentic hearth-baked signature Cosi® bread and distinctive high-quality, fresh ingredients. We believe the guest sees us as a cutting edge alternative to other fast casual restaurants, and we will strive to deliver on this expectation. Providing customers with an exceptional service and dining experience. We believe there are three areas that will give us distinction in category. First, our people need to provide hospitality beyond the guest’s expectation. Second, we need to be as fast as the guest needs us to be: speed can provide a competitive advantage. Third, our restaurants need to provide a distinctive environment, whether in an urban setting, a university setting, the suburbs or at the airport. Creating an environment where great people want to work. Building a great company is dependent on having outstanding managers and hourly partners. Cosi will focus first on being the employer of choice, creating a positive environment where our people love to come to work. We believe if we create a positive environment and focus on the development of our people, we can hold ourselves to a standard of excellence. By becoming a great company for our people, we will be able to expect everyone to take great care of the guest and our Company. Brand Position. We believe we understand how the guest sees Cosi and how the industry is evolving. We believe Cosi is properly positioned in an industry where “better, better for you” is the direction the consumer’s taste is heading. We are working to position Cosi as a food-forward concept through new menu innovation that utilizes differentiated ingredients, such as our use of Kale, Avocados and Sweet Potatoes. We will strive to continue to enhance our catering offerings, with a focus on fresh and flavorful products, to drive growth in catering sales in the breakfast, lunch and snacking segments. We will continue to focus on combinations of healthy alternatives and bold flavors: unique ingredient combinations that we believe appeal to our guests’ preferences for flavorful and nutritional food. Developing a contemporary and welcoming environment. During 2014, we opened one Company-owned and two franchised locations that included more contemporary design elements reflecting the look and feel of an urban café. These locations included ambience enhancements such as communal tables, distinctive lighting treatments, chalk boards, and the use of more contemporary color throughout the restaurant. There are key learnings in our recent openings we will bring together for a consistent go forward design for Cosi. Operating our restaurants efficiently. Cosi has long been committed to operating disciplines that are designed to optimize the cost structure of our restaurants and to be applied consistently across all of our restaurants, Company-owned and franchised, and we continuously seek to refine and improve upon those disciplines both domestically and internationally. Build a system of franchised restaurants and develop Company-owned restaurants. For the near term our financial health is directly tied to our Company-owned restaurants (restaurants that we own as opposed to franchised restaurants): these restaurants must be profitable for Cosi to be profitable. We must increase comparable restaurant sales and we believe the strategies set forth above will help us achieve those sales. At the same time our franchising and area developer model will be the primary driver of our growth strategy. We launched our franchising program in fiscal 2004 and seek to expand our franchise system by attracting highly qualified domestic franchisees. Key to this is a replicable restaurant model which generates strong returns. We believe the model exists within our current portfolio and we have made capturing this model a priority. As part of our strategy to expand our franchise base and attract quality franchisees, we will consider the potential sale of a restaurant or a group of restaurants to serve as a base for new franchisees looking to develop Cosi in certain markets. We prefer that our franchisees have experience in multi-unit restaurant operations and development. We believe that our concept positioning, national and international opportunity for growth, and potential for strong unit-level economics will enable us to attract experienced and well-capitalized area developers. We are currently eligible to offer franchises in 47 states and the District of Columbia. We will continue to pursue nontraditional trade channel development. We will continue to explore franchise relationships and strategic alliances with the Cosi concept in educational institutions, airports, train stations, museums, medical facilities, and other venues that meet our operating and financial criteria. We believe that this is an attractive opportunity to further our growth through alternative venues in either a full service or smaller grab-and-go format. Franchisees currently operate Cosi restaurants pursuant to franchise agreements at Georgetown University in Washington, D.C. Temple University in Philadelphia, PA, Fordham University in New York, NY, and The College of William and Mary in Williamsburg, VA. Our franchisees also operate at several airport locations (Logan, Dulles, and Reagan) under franchise agreements with some sites offering a more limited menu. We offer proprietary food and beverage products for four major dayparts — breakfast, lunch, snacking and dinner. Our food menu includes Cosi® Squagels®, sandwiches, salads, bowls, soups, appetizers, melts, flatbread pizzas, breakfast wraps, S’mores and other desserts. We feature our authentic hearth-baked signature Cosi® bread in two varieties, Original and Multi-Grain. Our beverage menu features a variety of house coffees and other espresso-based beverages, seasonal fruit smoothies and hand-crafted specialty drinks, soft drinks, flavored teas and bottled beverages, which include premium still and sparkling waters. Core to the Cosi® menu is a commitment to healthier alternatives, including our Smart Fit and “lighter side” menu options. Smart Fit menu items are intended to help supplement a balanced diet and active lifestyle while our “lighter side” menu features lower-calorie versions of popular menu items. We offer beer and wine at many of our locations and an additional limited selection of alcoholic beverages in some locations. For our young guests, we offer our Parent Magazine award-winning Kids Menu which includes an activity page and crayons. Most of our restaurants offer catering service for breakfast, lunch, and afternoon snacking. Our catering offerings include breakfast baskets, lunch buffets, box lunches, dessert platters, parfait bars, hot soups, steel-cut oatmeal, and most of our menu offerings. We operate a catering call center in New York City which coordinates the ordering and fulfillment process for all Company-owned restaurants. We offer set up and delivery services by Cosi® personnel to all of our catering customers. We periodically introduce new menu platforms and products in order to keep our product offerings relevant to consumers in each daypart. Our expanded breakfast menu now includes Cosi® Squagels®, oatmeal, fresh fruit parfaits and a variety of craveable signature breakfast wraps and sandwiches. We enhance our guests’ dining options by offering “Cosi® Taste Two”, which allows them to create their own meal by combining two items of proportion from our offerings of unique sandwiches, fresh salads, soups, and shareable-sized flatbread pizzas. New recipes are developed by our culinary innovation team with the support of the supply chain team. On December 29, 2014, we had 64 Company-owned restaurants and 1725 employees, of whom 53 served in administrative or executive capacities, 157 served as restaurant management employees and 1515 were hourly restaurant employees. None of our employees are covered by a collective bargaining agreement, and we have never experienced an organized work stoppage or strike. We believe that our compensation packages are competitive and our relations with our employees are good. Management Structure. The restaurant operations team is built around regional districts led by Area Managers, who report to Regional Directors. The Regional Directors report directly to the VP of Operations. The Regional Directors and the Area Managers are responsible for all operations, and with the Human Resources and Training teams, training, recruiting and employee relations within their regions. The Regional Directors are also responsible for the financial plan for their respective Company-owned locations and for the people development plan to support the execution of the financial plan. To ensure consistent performance, execution and application of our policies and procedures, we have a Standard Operations Manual which is reviewed and updated periodically. Sales Forecasting. The Regional Directors and Area Managers have real-time access to sales forecasts and actual sales information through our web-based reporting system. This allows the entire management team to plan staffing requirements on a weekly, daily and even hourly basis to effectively serve our customers. Product Quality. Our food and beverage product quality is managed at four critical stages: sourcing, distribution, line readiness and product preparation. Products are delivered to the restaurants several times each week so that all restaurants maintain fresh, quality products. Because our restaurants serve a different variety of products during different dayparts, a specific line-readiness checklist is completed to ensure that the products have been rotated, prepared and staged correctly. Finally, our partner training program includes certification in both product knowledge and product preparation standards. Food and Labor Cost Controls. Our information system allows us to track actual versus theoretical cost of goods sold. Detailed reports are available at the restaurant level showing variances on an item‑by‑item basis. The system is interfaced into our accounts payable and general ledger systems so that restaurant managers have control of their operations and can be held accountable for their results. Our labor management standards help our managers control labor and ensure that staffing levels are appropriate to meet our service standards. Our reporting system provides our multi‑unit managers with performance reports that help them make staffing adjustments during the course of the week. All labor scheduling is approved by an Area Manager and unit-level performance is reviewed weekly. For manager and support controllable costs, we use either a fixed dollar budget standard or a percentage of net sales approach to plan expenditures effectively. Actual performance for each of these expense items is compared to budget on a weekly basis to help ensure accountability and operational alignment with financial planning efforts. We believe that the combination of these structured restaurant operating systems and technologies allows our restaurant managers to focus their time more effectively on the day‑to‑day drivers of our business. Our systems are structured for the integration of data from the point-of-sale and back-office modules in the restaurants to our financial, reporting, and inventory management systems. Key information relating to restaurant operations is uploaded onto a secure website multiple times throughout the day. This operational restaurant information is available to key internal customers, along with pre-selected reports that are automatically distributed to our operations team. We use a select group of service providers to supplement our information technology infrastructure and system offerings. This provides us access to up-to-date technology and allows us the flexibility to adjust service levels and costs as needed. Our application strategy includes utilizing web-based technology to provide timely information to operate and manage the business. We have business continuity procedures in place for all critical hardware, software, data and related processes. The procedures encompass scheduled back-ups, off‑site storage, security, and failover configurations with redundancy built into key processes. We have an agreement with Distribution Market Advantage, Inc. (“Distribution Marketing Advantage”) that provides us access to a national network of independent distributors. Under this agreement, the independent distributors supply us with approximately 76% of our food and paper products, primarily under pricing agreements that we negotiate directly with the suppliers. This agreement will expire on December 30, 2015. We also use a consolidated buying group to take advantage of volume purchasing of various commodity and packaging items. We have a long-term beverage marketing agreement with the Coca‑Cola Company. We received a marketing allowance under this agreement, which is being recognized as a reduction to expense ratably based on actual products purchased. Effective January 1, 2011, the beverage marketing agreement with the Coca-Cola Company was amended to provide for additional products as well as higher marketing allowances based on purchases. In October 2010, we entered into an agreement to purchase all contracted coffee products through a single supplier, Royal Cup Coffee, Inc. This was a five-year agreement, which will be terminating in April 2015. In April 2015, we will enter into an agreement to purchase all contracted coffee products through a single supplier, Coffee Bean International (a division of Farmer Brothers). This is a three year agreement, expiring in 2018. Our primary suppliers and independent distributors have parallel facilities and systems to minimize the risk of any disruption of our supply chain. The restaurant industry is intensely competitive, and we compete with many well‑established food service companies, including other sandwich retailers, specialty coffee retailers, bagel shops, fast food and casual dining restaurants, delicatessens, cafes, bars, take‑out food service companies, supermarkets and convenience stores. The principal factors on which we compete are taste, quality and price of products, customer service, atmosphere, location and overall guest experience. Our competitors change with each daypart, ranging from coffee bars and bakery cafes in the morning daypart, to fast-food restaurants and cafes during the lunch daypart, to casual-dining chains during the dinner daypart. Many of our competitors or potential competitors have substantially greater financial and other resources than we do, which may allow them to react more quickly to changes in pricing, marketing and the quick-service and fast-causal restaurant industries. We also compete with other employers in our markets for hourly workers and may be subject to higher labor costs. We believe that our concept, attractive price‑value relationship and quality of products and service allow us to compete favorably with our competitors. We have the following U.S. Trademark registrations: “COSÌ”, “(SUN & MOON DESIGN)”, “GET COSÌ”, “COSÌ (& SUN & MOON DESIGN)”, “LIFE SHOULD BE DELICIOUS”, “(SUN & MOON SMILEY FACE DESIGN)”, “COSÌ (& HEARTH DESIGN)”, “(HEARTH DESIGN)”, “COSÌ BREAK BAR”, “COSÌ CARD”, “COSÌ CORNERS”, “COSÌ DOWNTOWN”, “COSÌ PRONTO”, “HEARTH-BAKED DINNERS”, COSÌ (& DESIGN)”, “SIMPLY GOOD TASTE”, “SQUAGELS”, “XANDO”, “SQUAGEL” and “TASTE TWO”. We have U.S. Trademark applications pending for the following trademark: “SMART FIT”. “COSÌ SANDWICH BAR”, “ARCTIC”, “SLIM LATTE”, “COSÌ LIGHTER SIDE”, “COSÌ DUO TASTE TWO”, “RELAX. CATERING BY COSÌ (& DESIGN)” and “(RECYCLING DESIGN)” are unregistered trademarks. We have registered the trademark “COSÌ” in twenty-three foreign jurisdictions with respect to restaurant services. Also, we have registered the following trademarks with respect to restaurant services: “COSI (& HEARTH DESIGN)” in two foreign jurisdictions; “(HEARTH DESIGN)” in six foreign jurisdictions; “SIMPLY GOOD TASTE” in two foreign jurisdictions; “COSI (& SUN & MOON DESIGN) in two foreign jurisdictions, “COSI (in Russian)” in one foreign jurisdiction, “LIFE SHOULD BE DELICIOUS” in two foreign jurisdictions, “(SUN & MOON DESIGN)” in one foreign jurisdiction, and “COSITICO” in one foreign jurisdiction. We have trademark applications pending for registration of the following trademarks with respect to restaurant services: “COSÌ” in two foreign jurisdictions; and “COSI (& SUN AND MOON DESIGN)” in one foreign jurisdiction. Our restaurants are subject to regulation by federal agencies and to licensing and regulation by state, local and, where applicable, foreign health, sanitation, building, zoning, safety, fire and other departments relating to the development and operation of restaurants. These regulations include matters relating to environmental, building, construction and zoning requirements, franchising and the preparation and sale of food and alcoholic beverages. In addition, our facilities are licensed and subject to regulation under state and local fire, health and safety codes. Our restaurants that sell alcoholic beverages are required to obtain a license from a state authority and, in certain locations, county and/or municipal authorities. Typically, licenses must be renewed annually and may be revoked or suspended for cause at any time. Alcoholic beverage control regulations relate to numerous aspects of the daily operations of each of our restaurants, including minimum age of patrons and employees, hours of operation, advertising, wholesale purchasing, inventory control and handling, and storage and dispensing of alcoholic beverages. We have not encountered any material problems relating to alcoholic beverage licenses to date. The failure to receive or retain a liquor license in a particular location could adversely affect that restaurant and may impact our ability to obtain such a license elsewhere. We currently serve alcohol in 30 of our restaurants. We are subject to “dram shop” statutes in the states in which our restaurants sell alcoholic beverages. These statutes generally provide a person injured by an intoxicated person the right to recover damages from an establishment that wrongfully served alcoholic beverages to the intoxicated individual. We carry liquor liability coverage as part of our existing comprehensive general liability insurance, which we believe is consistent with coverage carried by other similarly-situated entities in the restaurant industry. Although we are covered by insurance, a judgment against us under a dram‑shop statute in excess of our liability coverage could have a material adverse effect on us. Our operations are also subject to federal and state laws governing such matters as wages, working conditions, work eligibility requirements, overtime, insurance matters, workers’ compensation, child labor laws, and anti-discrimination laws. Some states have set minimum wage requirements higher than the federal level. Some of our hourly personnel at our restaurants are paid at rates based on the applicable minimum wage, and increases in the minimum wage will directly affect our labor costs. We are also subject to the Americans with Disabilities Act of 1990, which, among other things, prohibits discrimination on the basis of disability in public accommodations and employment. We are required to comply with the Americans with Disabilities Act and regulations relating to accommodating the needs of the disabled in connection with the construction of new facilities and with significant renovations of existing facilities. In recent years, there has been an increased legislative, regulatory and consumer focus at the federal, state and municipal levels on the food industry, including nutrition, labeling and advertising practices. Casual dining chains have been a particular focus. For example, New York City and a number of other jurisdictions around the U.S. adopted regulations requiring that chain restaurants include caloric or other nutritional information on their menu boards and on printed menus, or make other nutrition information available, which must be plainly visible to consumers at the point of ordering. Nationwide nutrition disclosure requirements included in the U.S. health care reform law will go into effect December 1, 2015, and we may in the future become subject to other initiatives in the area of nutritional disclosure or advertising. These nutrition disclosure requirements may increase our expenses, particularly given differences among applicable legal requirements and practices within the restaurant industry with respect to testing and disclosure, or otherwise adversely affect our business and results of operations. During our operating history, we have been unable to achieve profitability. In fiscal 2014, we incurred net losses of approximately $16.2 million, and, since we were formed, we have incurred net losses of approximately $309.7 million through the end of fiscal 2014, primarily due to funding operating losses, which have included significant impairment charges, costs associated with closing restaurants, early lease termination fees, and new restaurant opening expenses. We cannot predict whether we will be able to achieve or sustain revenue growth, profitability or positive cash flow in the future. See “Management’s Discussion and Analysis of Financial Conditions and Results of Operations” and the financial statements included in this Annual Report on Form 10‑K for information on the history of our losses. If internally generated cash flow from our restaurants does not meet our expectations, our business, results of operations and financial condition could be materially adversely affected. Our cash resources, and therefore our liquidity, are highly dependent upon the level of internally generated cash from operations and upon future financing transactions. Although we believe that we have sufficient liquidity to fund our working capital requirements for the next twelve months, if cash flows from our existing restaurants or from franchise fees and royalties do not meet our expectations or are otherwise insufficient to satisfy our cash needs, we may have to seek additional financing from external sources to continue funding our operations or reduce or cease our plans to open or franchise new restaurants. We cannot predict whether any such financing will be available on terms acceptable to us, or at all. We may need additional capital in the future and it may not be available on acceptable terms. Our business has in the past required, and may continue to require, significant additional capital to, among other things, fund our operations, increase the number of Company-owned or franchised restaurants, expand the range of services we offer and finance future acquisitions and investments. There is no assurance that financing will be available on terms acceptable to us, or at all. Our ability to obtain additional financing will be subject to a number of factors, including market conditions, our operating performance and investor sentiment. These factors may make the timing, amount, terms and conditions of additional financings unattractive to us. If we are unable to raise additional capital, our business, results of operations and financial condition could be materially adversely affected. We may not be able to achieve our planned expansion. If we or our franchisees are unable to successfully open new restaurants, our revenue growth rate and profits may be reduced. We must identify and obtain a sufficient number of suitable new restaurant sites for us to achieve a sustainable revenue growth rate. We require that all proposed restaurant sites, whether Company-owned or franchised, meet site-selection criteria established by us. We and our franchisees may not be able to find sufficient new restaurant sites to support our planned expansion in future periods. We face significant competition from other restaurant companies and retailers for sites that meet our criteria, and the supply of sites may be limited in some markets. As a result of these factors, our costs to obtain and lease sites may increase, or we may not be able to obtain certain sites due to unacceptable costs. Our inability to obtain suitable restaurant sites at reasonable costs may reduce our growth rate, which may affect the expectations of securities analysts and others and thus our stock price. Our expansion in existing markets can cause sales in some of our existing restaurants to decline, which could result in restaurant closures. As part of our expansion strategy, we and our franchisees intend to open new restaurants in our existing markets. Since we typically draw customers from a relatively small radius around each of our restaurants, the sales performance and customer counts for restaurants near the area in which a new restaurant opens may decline due to cannibalization, which could result in restaurant closures. In addition, new restaurants added in existing markets may not achieve the same operating performance as our existing restaurants. Our expansion into new markets, both foreign and domestic, may present increased risks due to our unfamiliarity with the area. The restaurants we open in new geographic regions may not achieve market acceptance. Some of our new franchised restaurants are located in areas where we have little or no meaningful experience. Those markets may have different demographic characteristics, competitive conditions, consumer tastes and discretionary spending patterns than our existing markets that may cause our new restaurants to be less successful than restaurants in our existing markets. An additional risk in expansion into new markets is the lack of market awareness of the Cosi® brand. Restaurants opened in new markets may open at lower average weekly sales volumes than restaurants opened in existing markets and may have higher restaurant-level operating expense ratios than in existing markets. Sales at restaurants opened in new markets may take longer to reach mature average annual Company-owned restaurant sales, if at all, thereby affecting the profitability of these restaurants. We have an international license agreement with a licensee for the development of Cosi® restaurants in six countries in the Persian Gulf. This licensee currently operates one franchise locations in the United Arab Emirates. We also have an international license agreement with a licensee in Costa Rica who currently operates four franchised restaurants there. As these franchise locations and future foreign locations open, the Company's international operations will be subjected to various factors of uncertainty. The Company's business outside of the United States is subject to a number of additional factors, including international economic and political conditions, local economic conditions, differing cultures and consumer preferences, currency regulations and fluctuations, diverse government regulations and tax systems, uncertain or differing interpretations of rights and obligations in connection with international license agreements and the collection of royalties from international licensees, the availability and cost of land and construction costs, and the availability of experienced management, appropriate licensees, and joint venture partners. Although we believe that we have developed the support structure required for international growth in these countries, there is no assurance that such growth will occur or that international operations will be profitable. We may not be able to successfully incorporate a franchising and area developer model into our strategy. We have and will continue to incorporate a franchising and area developer model into our business strategy in certain selected markets. We may not be successful in attracting franchisees and developers to the Cosi® concept or identifying franchisees and developers that have the business abilities or access to financial resources necessary to open our restaurants or to successfully develop or operate our restaurants in a manner consistent with our standards. Incorporating a franchising and area developer model into our strategy also requires us to devote significant management and financial resources to support the franchise of our restaurants. Our future performance will depend on our franchisees’ ability to execute our concept and capitalize upon our brand recognition and marketing. We may not be able to recruit franchisees who have the business abilities or financial resources necessary to open restaurants on schedule, or who will conduct operations in a manner consistent with our concept and standards. Our franchisees may not be able to operate restaurants in a profitable manner. If we are not successful in incorporating a franchising or area developer model into our strategy, we may experience delays in our growth or may not be able to expand and grow our business. If our franchisees cannot develop or finance new restaurants, build them on suitable sites or open them on schedule, our growth and success may be impeded. Our growth depends in large part upon our ability to establish a successful and effective franchise program and to attract qualified franchisees. If our franchisees are unable to locate suitable sites for new restaurants, negotiate acceptable lease or purchase terms, obtain the necessary financial or management resources, meet construction schedules or obtain the necessary permits and government approvals, our growth plans may be negatively affected. We cannot assure you that any of the restaurants our franchisees open will be profitable. Additional foodservice strategic alliances may not be successful and may materially adversely affect our business and results of operations. We may decide to enter into alliances with third parties to develop foodservice strategic alliances in select markets or through select channels. Identifying strategic partners, negotiating agreements and building such alliances may divert management’s attention away from our existing businesses and growth plans. If we are not successful in forming additional foodservice strategic alliances, we may experience delays in our growth and may not be able to expand and grow our business. If we do form strategic alliances, we cannot assure you that the restaurants opened pursuant to these strategic alliances will be profitable. Any inability to manage our growth effectively could materially adversely affect our operating results. Failure to manage our growth effectively could harm our business. We intend to grow in the future both through a franchising strategy and opening new Company-owned restaurants. Our existing restaurant management systems, financial and management controls and information systems may not be adequate to support our planned expansion. Our ability to manage our growth effectively will require us to continue to enhance these systems, procedures and controls. We must attract and retain talented operating personnel to maintain the quality and service levels at our existing and future restaurants. We may not be able to effectively manage these or other aspects of our expansion. We cannot assure you that we will be able to respond on a timely basis to all of the changing demands that our planned expansion will impose on management and on our existing infrastructure. If we are unable to manage our growth effectively, our business, results of operations and financial condition could be materially adversely impacted. If we are unable to successfully integrate future acquisitions, our business could be negatively impacted. Any acquisitions may also be costly. We may consider future strategic acquisitions. Acquisitions involve numerous risks, including difficulties assimilating new operations and products. In addition, acquisitions may require significant management time and capital resources. We cannot assure you that we will have access to the capital required to finance potential acquisitions on satisfactory terms, that any acquisition would result in long-term benefits to us, or that management would be able to manage effectively the resulting business. Future acquisitions are likely to result in the incurrence of additional indebtedness, which could contain restrictive covenants, or the issuance of additional equity securities, which could dilute our existing stockholders. We may also pay too much for a concept that we acquire relative to the actual economic return obtained. If our integration efforts are unsuccessful, our business and results of operations could suffer. If we are unable to execute our business strategy, we could be materially adversely affected. · general regional, national and, where applicable, foreign economic conditions. Each of these factors could delay or prevent us from successfully executing our business strategy, which could adversely affect our growth, revenues and our results of operations. Economic conditions in the United States and globally could adversely affect our business and financial results and have a material adverse effect on our liquidity and capital resources. If the economic conditions deteriorate or fail to substantially improve, many sectors of the economy may continue to be adversely impacted. As a retailer that depends upon consumer discretionary spending, we could face a challenging fiscal 2015 because our customers may make fewer discretionary purchases as a result of job losses, foreclosures, bankruptcies, reduced access to credit and falling home prices. Cosi®, as an “affordable luxury,” may be disproportionably affected by a significant decrease in customer traffic or lower average check prices as a result of customers switching to lower-priced products on our menu. Deterioration in the economic environment could potentially have a material adverse effect on our liquidity and capital resources, including our ability to raise additional capital if needed or to maintain satisfactory credit terms with our suppliers. Seasonality, inclement weather and other variable factors may adversely affect our sales and results of operations and could cause our quarterly results to fluctuate and fall below expectations of securities analysts and investors, resulting in a decline in our stock price. Our business is subject to significant seasonal fluctuations and weather influences on consumer spending and dining-out patterns. Inclement weather may result in reduced frequency of dining at our restaurants or lost restaurant visits. Customer counts (and consequently revenues) are generally highest in spring and summer months and lowest during the winter months because of the high proportion of our restaurants located in the Northern part of the country where inclement winter weather affects customer visits. As a result, our quarterly and yearly results have varied in the past, and we believe that our quarterly operating results will vary in the future. Other factors such as unanticipated increases in labor, commodities, energy, insurance or other operating costs may also cause our quarterly results to fluctuate. For this reason, you should not rely upon our quarterly operating results as indications of future performance. Franchisees are independent operators and are not our employees. Although we have developed criteria to evaluate and screen prospective franchisees, we are limited in the amount of control we can exercise over our franchisees, and the quality of franchised restaurant operations may be diminished by any number of factors beyond our control. Franchisees may not have the business acumen or financial resources necessary to successfully operate restaurants in a manner consistent with our standards and requirements and may not hire and train qualified managers and other restaurant personnel. Poor restaurant operations may affect each restaurant’s sales. Our image and reputation, and the image and reputation of our franchisees, may suffer materially, and system-wide sales could significantly decline if our franchisees do not operate successfully. We could face liability from our franchisees. A franchisee or government agency may bring legal action against us based on the franchisee/franchisor relationships. Various state, federal and, where applicable, foreign and international laws govern our relationship with our franchisees and potential sales of our franchised restaurants. If we fail to comply with these laws, we could be liable for damages to franchisees and fines or other penalties. Expensive litigation with our franchisees or government agencies may adversely affect both our profits and our important relations with our franchisees. Our financial results are affected by the financial results of our franchisees. We receive royalties from our franchisees. Our financial results are therefore to an extent contingent upon the operational and financial success of our franchisees, including implementation of our strategic plans, as well as their ability to secure adequate financing. If sales trends or economic conditions worsen for our franchisees, their financial health may worsen and our collection rates may decline. Additionally, refusal on the part of franchisees to renew their franchise agreements may result in decreased royalties. Entering into restructured franchise agreements may result in reduced franchise royalty rates in the future. Our restaurants are currently concentrated in the Northeastern, Midwestern, and Mid-Atlantic regions of the United States, particularly in the New York City, Chicago and Philadelphia areas. Accordingly, we are highly vulnerable to negative occurrences in these regions. We currently operate 64 Company-owned restaurants in Northeastern, Midwest, and Mid-Atlantic states, of which 24 are located in the New York City, Chicago and Philadelphia central business districts. As a result, we are particularly susceptible to adverse trends and economic conditions in these areas. In addition, given our geographical concentration, negative publicity regarding any of our restaurants could have a material adverse effect on our business and operations, as could other regional occurrences impacting the local economies in these markets. You should not rely on past average unit volumes as an indication of our future results of operations because they may fluctuate significantly. · the impact of the general economic conditions and high unemployment rates on consumer spending, particularly in geographic regions that contain a high concentration of our restaurants. Changes in our average unit volumes could cause the price of our common stock to fluctuate substantially. If we fail to comply with governmental regulations in one or more of the following areas or if these regulations change, our business could suffer. We may from time to time get audited for compliance with citizenship or work authorization requirements as well. Various states in which we operate are considering or have already adopted new immigration laws, and the U.S. Congress and Department of Homeland Security from time to time may consider or implement changes to Federal immigration laws, regulations or enforcement programs as well. Changes in immigration or work authorization laws may increase our obligations for compliance and oversight, which could subject us to additional costs and make our hiring process more cumbersome, or reduce the availability of potential employees. Although we require all workers to provide us with government-specified documentation evidencing their employment eligibility, some of our employees may, without our knowledge, be unauthorized workers. This may subject us to fines or penalties, and we could experience adverse publicity that negatively impacts our brand and may make it more difficult to hire and keep qualified employees. The comprehensive U.S. health care reform law enacted in 2010, the Patient Protection and Affordable Care Act, requires employers such as us to provide health insurance for all qualifying employees or pay penalties for not providing coverage. We are evaluating the impact the new law will have on us, and although we cannot predict with certainty the financial and operational impacts the new law will have, we expect that the requirement that we provide more extensive health benefits to employees than we currently do could have an adverse effect on our results of operations and financial position, as well as the restaurant industry in general. As a result of this law, we are likely in fiscal 2015 to see an increase in health insurance that may be large enough to materially impact our labor costs. Alternatively, if we choose not to provide the required health insurance or if some employees do not qualify for the required insurance, our employee culture may be harmed and we may face adverse publicity that negatively impacts our brand. Additionally, while we do not currently have any unionized employees, union organizers have engaged in efforts to organize employees of other restaurant companies. If a significant portion of our employees were to become union organized, our labor costs could increase and our efforts to maintain a culture appealing only to top-performing employees could be impaired. Potential changes in labor laws could increase the likelihood of some or all of our employees being subjected to greater organized labor influence, and could have an adverse effect on our business and financial results by imposing requirements that could potentially increase our costs, reduce our flexibility and impact our employee culture. We are subject to the U.S. Americans with Disabilities Act, or ADA, and similar state laws that give civil rights protections to individuals with disabilities in the context of employment, public accommodations and other areas. Although the costs that we have incurred in the past in connection with ADA-related complaints have not been material, we may in the future have to modify restaurants, for example by adding access ramps or redesigning certain architectural features, to provide service to or make reasonable accommodations for disabled persons under these laws. The expenses associated with these modifications, or any damages, legal fees and costs associated with litigating or resolving claims under the ADA or similar state laws, could be material. In recent years, there has been an increased legislative, regulatory and consumer focus at the federal, state and municipal levels on the food industry, including nutrition, labeling and advertising practices. Casual dining chains have been a particular focus. For example, New York City and a number of other jurisdictions around the U.S. have adopted regulations requiring that chain restaurants include caloric or other nutritional information on their menu boards and on printed menus, or make other nutrition information available, which must be plainly visible to consumers at the point of ordering. Nationwide nutrition disclosure included in the U.S. health care reform law will go into effect December 1, 2015, and we may in the future become subject to other initiatives in the area of nutrition disclosure or advertising, such as requirements to provide information about the nutritional content of our food, may increase our expenses or slow customers as they move through the line, decreasing our throughput. These initiatives may also change customer buying habits in a way that adversely impacts our sales. We are required to collect and maintain personal information about our employees, and we collect information about customers as part of some of our marketing programs as well. The collection and use of such information is regulated at the federal and state levels, and by the European Union and its member states, and the regulatory environment related to information security and privacy is increasingly demanding. At the same time, we are relying increasingly on cloud computing and other technologies that result in third parties holding significant amounts of customer or employee information on our behalf. If the security and information systems of ours or of outsourced third party providers we use to store or process such information are compromised or if we, or such third parties, otherwise fail to comply with these laws and regulations, we could face litigation and the imposition of penalties that could adversely affect our financial performance. Our reputation as a brand or as an employer could also be adversely affected from these types of security breaches or regulatory violations, which could impair our sales or ability to attract and keep qualified employees. We did not have any cybersecurity issues during Fiscal 2014. Each of our restaurants is also subject to state and local licensing and regulation by health, alcoholic beverage, sanitation, food and workplace safety and other agencies. If we fail to obtain or maintain all necessary licenses, we may be forced to delay or cancel new restaurant openings and close or reduce operations at existing locations. In addition, our sale of alcoholic beverages subjects us to “dram shop” statutes in some states. These statutes allow an injured person to recover damages from an establishment that served alcoholic beverages to an intoxicated person. Although we take significant precautions to ensure that all employees are trained in the responsible service of alcohol and maintain insurance policies in accordance with all state regulations regarding the sale of alcoholic beverages, the misuse of alcoholic beverages by customers may create considerable risks for us. If we are the subject of a judgment substantially in excess of our insurance coverage, or if we fail to maintain our insurance coverage, our business, financial condition, operating results or cash flows could be materially and adversely affected. In addition, stringent and varied requirements of local regulators with respect to zoning, land use and environmental factors could delay or prevent development of new restaurants in particular locations. The effect of recent changes to U.S. healthcare laws may increase our healthcare costs and negatively impact our financial results. We offer eligible full-time and part-time U.S. employees the opportunity to enroll in healthcare coverage subsidized by us. For various reasons, many of our eligible employees currently choose not to participate in our healthcare plans. However, under the comprehensive U.S. health care reform law enacted in 2010, the Affordable Care Act, changes that became effective in 2014, and especially the employer mandate and employer penalties that became effective January 1, 2015, may increase our labor costs significantly. Changes in the law that took effect in 2014, including the imposition of a penalty on individuals who do not obtain healthcare coverage, may result in employees who are currently eligible but elect not to participate in our healthcare plans increasingly finding it advantageous to do so, which may increase our healthcare costs in the future. In 2015, we adopted a qualifying plan under the Affordable Care Act for our full-time hourly employees, which may further increase our healthcare expenses. It is also possible that even in light of recent changes in the healthcare plans we offer, healthcare plans offered by other companies with which we compete for employees will make us less attractive to our current or potential employees. And, in any event, implementing the requirements of the Affordable Care Act has imposed some additional administrative costs on us, and those costs may increase over time. The costs and other effects of these new healthcare requirements cannot be determined with certainty, but they may have a material adverse effect on our financial and operating results. Our failure or inability to enforce our trademarks or other proprietary rights could adversely affect our competitive position or the value of our brand. We own certain common law trademark rights and a number of federal and international trademark and service mark registrations, and proprietary rights to certain of our core menu offerings. We believe that our trademarks and other proprietary rights are important to our success and our competitive position. We, therefore, devote appropriate resources to the protection of our trademarks and proprietary rights. The protective actions that we take, however, may not be enough to prevent unauthorized usage or imitation by others, which might cause us to incur significant litigation costs and could harm our image or our brand or competitive position. We also cannot assure you that third parties will not claim that our trademarks or offerings infringe the proprietary rights of third parties. Any such claim, whether or not it has merit, could be time-consuming, result in costly litigation, cause product delays or require us to enter into royalty or licensing agreements. As a result, any such claim could have a material adverse effect on our business, results of operations and financial condition. We hold significant amounts of illiquid assets and may have to dispose of them on unfavorable terms. As of the end of fiscal 2014, we had approximately $7.3 million in net fixed assets that we have defined as illiquid assets, which include leasehold improvements, equipment, and furniture and fixtures. These assets cannot be converted into cash quickly and easily. We may be compelled, based on a significant underperformance of a specific location or market, to dispose of some illiquid assets on unfavorable terms, which could have a material adverse effect on our business. We may face litigation that could have a material adverse effect on our business, financial condition and results of operations. From time to time, we are a defendant in litigation arising in the ordinary course of our business. Our customers may file complaints or lawsuits against us alleging that we are responsible for an illness or injury they suffered at or after a visit to a Cosi® restaurant, or alleging that there was a problem with food quality or operations at a Cosi® restaurant. We may also be subject to a variety of other claims arising in the ordinary course of our business, including personal injury claims, contract claims, claims from franchisees and claims alleging violations of federal, state and, where applicable, foreign law regarding workplace and employment matters, discrimination and similar matters. We could also become subject to class action lawsuits related to these matters in the future. Regardless of whether any future claims against us are valid or whether we are found to be liable, claims may be expensive to defend and may divert our management's attention away from our operations and hurt our performance. The outcome of litigation, particularly class action lawsuits and regulatory actions, is difficult to assess or quantify. Plaintiffs in these types of lawsuits may seek recovery of very large or indeterminate amounts, and the magnitude of the potential loss relating to such lawsuits may remain unknown for substantial periods of time. A judgment significantly in excess of our insurance coverage for any claims could materially adversely affect our financial condition or results of operations. There may also be adverse publicity associated with litigation that could decrease customer acceptance of our services or those of our franchisees, regardless of whether the allegations are valid or whether we are ultimately found liable. As a result, litigation may have a material adverse effect on our business, financial condition and results of operations. Moreover, complaints, litigation or adverse publicity experienced by one or more of our franchisees could also hurt our business as a whole. If we are unable to protect our customers’ credit card data, we could be exposed to data loss, litigation and liability, and our reputation could be significantly harmed. In connection with credit card sales, we transmit confidential credit card information securely over public networks. Third parties may have the technology or know-how to breach the security of this customer information, and our security measures may not effectively prohibit others from obtaining improper access to this information. If a person is able to circumvent our security measures, he or she could destroy or steal valuable information or disrupt our operations. Any security breach could expose us to risks of data loss, litigation and liability and could seriously disrupt our operations and any resulting negative publicity could significantly harm our reputation. We rely on computer systems and information technology to run our business. Any material failure, interruption or security breach of our computer systems or information technology may adversely affect the operation of the business and our results of operations. Computer viruses or terrorism may disrupt our operations and adversely affect our operating results. Despite our implementation of security measures, all of our technology systems are vulnerable to disability or failures due to hacking, viruses, acts of war or terrorism, and other causes. If our technology systems were to fail and we were unable to recover in a timely manner, we would be unable to fulfill critical business functions, which could have a material adverse effect on our business, operating results, and financial condition. We have a new management team that does not have proven success with the Company. Our Chief Financial Officer resigned from the Company on January 21, 2015, for personal reasons. Richard Bagge was appointed to serve as Interim Chief Financial Officer of the Company until a successor is identified. The Company has engaged a search firm to commence a search for a permanent Chief Financial Officer. We cannot foresee how long this search will take. In addition, a significant portion of our senior leadership team, including our Chief Executive Officer and President, has been in place for only a relatively short period of time. The new members of our senior leadership team do not have previous experience with us, and we cannot assure you that they will fully integrate themselves into our business or that they will effectively manage our business affairs. Our failure to assimilate the new members of our senior leadership team, or the failure of the members of our new senior leadership team to perform effectively, or the loss of any of the members of our senior leadership team, could have a material adverse effect on our business, financial condition and results of operations. Our business is affected by changes in consumer preferences. Our success depends, in part, upon the popularity of our food and beverage products, our ability to develop new menu items that appeal to consumers and what we believe is an emerging trend in consumer preferences toward fast casual restaurants. We depend on consumers who prefer made-to-order food in a sophisticated environment and are willing to pay a premium price for our products. We also depend on trends toward consumers eating away from home more often. Shifts in consumer preferences away from our restaurants or cuisine, our inability to develop new menu items that appeal to consumers or changes in our menu that eliminate items popular with some consumers could harm our business and future profitability. Natural disasters, war, acts of terrorism or other armed conflict, or the threat of such actions, on the United States or international economies may cause a decline in discretionary consumer spending, which would negatively affect our business. Our success depends to a significant extent on discretionary consumer spending, which is influenced by general economic and political conditions and the availability of discretionary income. Discretionary consumer spending may decline in the event of a natural disaster, war, acts of terrorism or other armed conflict. Accordingly, we may experience a decline in sales during periods of uncertainty like the one that followed the September 11, 2001, terrorist attacks on the United States. In addition, economic uncertainty due to military action overseas, such as the recent wars in Iraq and Afghanistan, and other military, diplomatic or financial responses, may lead to further declines in sales. Any decline in consumer spending or economic conditions could reduce customer traffic or impose practical limits on pricing, either of which could have a material adverse effect on our sales, results of operations, business and financial condition. In the event of a natural disaster or acts of terrorism in the United States, or the threat of either, we may be required to suspend operations in some or all of our restaurants, which could have a material adverse impact on our business, financial condition, and results of operation. Our success depends on our ability to compete with many food service businesses. The restaurant industry is intensely competitive, and we compete with many well-established food service companies on the basis of taste, quality and price of product offered, customer service, atmosphere, location and overall customer experience. We compete with other sandwich retailers, specialty coffee retailers, bagel shops, fast-food restaurants, delicatessens, cafes, bars, take-out food service companies, supermarkets and convenience stores. Our competitors change with each daypart (breakfast, lunch dinner, and snack), ranging from coffee bars and bakery cafes during the breakfast and lunch dayparts to casual dining chains during the dinner daypart. Aggressive pricing by our competitors or the entrance of new competitors into our markets could reduce our sales and profit margins. Many of our competitors or potential competitors have substantially greater financial and other resources than we do, which may allow them to react to changes in pricing, marketing and the quick-service restaurant industry better than we can. As competitors expand their operations, we expect competition to intensify. We also compete with other employers in our markets for hourly workers and may be subject to higher labor costs. Changes in food and supply costs and availability could adversely affect our results of operations. Our restaurants receive frequent deliveries of products. Most of these deliveries are made by distributors who are part of a national network of independent distributors with whom we have a distribution agreement. These independent distributors supply us with approximately 76% of our food and paper products under an agreement which expires in December 2015. Our profitability depends in part on our ability to anticipate and react to changes in food and supply costs, such as the volatility in certain commodity markets we experienced in recent years. Certain commodities, such as wheat, coffee, poultry, fresh produce, and dairy and dairy-related products, have experienced significant fluctuations in the recent past. These types of increases could have an adverse effect on us during fiscal 2015 and in future fiscal years. Although many of our products are made to our specifications, we believe that alternative distribution sources are available for the majority of our ingredients and products. We believe that we have adequate sources of supply for our ingredients and products to support our restaurant operations and, if necessary, we can make menu modifications to address any material supply issues. However, there are many factors which can cause shortages or interruptions in the supply of our ingredients and products, including weather, unanticipated demand, labor, production or distribution problems, quality issues and cost, some of which are beyond our control, and any of which could have an adverse effect on our business and results of operations. Health concerns relating to the consumption of beef, poultry, produce or other food products could adversely affect the price and availability of beef, poultry, produce, and other food products, consumer preferences and our results of operations and stock price. Outbreaks of avian flu (bird flu) or other food-borne illnesses, such as “mad cow disease,” E.coli, salmonella, or hepatitis A, could adversely affect the price and availability of beef, poultry or other food products. As a result, we could experience a significant increase in cost of food. In addition, like other restaurant chains, consumer preferences could be affected by health concerns about the consumption of poultry, beef, or produce, the key ingredients in many of our menu items, or by negative publicity concerning food quality, illness and injury generally, such as negative publicity concerning, E.coli, salmonella, “mad cow disease” or “bird flu”, publication of government or industry findings about food products we serve or other health concerns or operating issues stemming from the food served in our restaurants. Our operational controls and training may not be fully effective in preventing all food-borne illnesses. Some food-borne illness incidents could be caused by food suppliers and transporters and would be outside of our control. If our food suppliers and transporters do not comply with governmental health regulations, they may not be able to deliver food products or we may be subject to food product recalls. Any negative publicity, health concerns or specific outbreaks of food-borne illnesses attributed to one or more of our restaurants, or the perception of an outbreak, could result in a decrease in customer traffic to our restaurants and could have a material adverse effect on our sales, results of operations, business, financial condition and stock price. The food service industry is affected by litigation and publicity concerning food quality, health and other issues, which can cause customers to avoid our products and result in liabilities. Food service businesses can be adversely affected by litigation and complaints from customers or government authorities resulting from food quality, illness, injury or other health concerns or operating issues stemming from one restaurant or a limited number of restaurants. Adverse publicity about these allegations may negatively affect us, regardless of whether the allegations are true, by discouraging customers from buying our products. We could also incur significant liabilities if a lawsuit or claim results in a decision against us or if we incur litigation costs, regardless of the result. Our business could be adversely affected by increased labor costs or labor shortages. Labor is a primary component in the cost of operating our business. We devote significant resources to recruiting and training our managers and employees. Increased labor costs, due to factors like additional taxes, or requirements to incur additional employee benefits costs, including the requirements of the Patient Protection and Affordable Care Act, or the Affordable Care Act, (discussed further under “Regulatory and Legal Risks — The effect of recent changes to U.S. healthcare laws may increase our healthcare costs and negatively impact our financial results,”), as well as competition, increased minimum wage requirements, paid sick leave or vacation accrual mandates, and any changes in our restaurant staffing structure would adversely impact our operating expenses. In addition, our success depends on our ability to attract, motivate and retain qualified employees, including restaurant managers and staff, to keep pace with our needs. If we are unable to do so, our results of operations may be adversely affected. We have received no written comments regarding our periodic or current reports from the staff of the Securities and Exchange Commission that were issued 180 days or more preceding the end of our 2014 fiscal year and that remain unresolved. Our principal corporate offices are currently located at 294 Washington Street, Suite 510, Boston, Massachusetts 02108. The lease for our corporate offices expires in May 2019. We believe the offices are adequate to accommodate our needs. All of our restaurants are located on leased properties. Each lease typically has a 10‑year base rent period, with various renewal options. In addition to the base rent, some leases provide for contingent rental payments, insurance, common area, and other operating costs. At most locations, we reimburse the landlord for a proportionate share of the landlord’s annual real estate taxes. From time to time, we are a defendant in litigation arising in the ordinary course of our business. As of the date of this report, there are no legal proceedings pending which, at this time, are expected to have a material adverse effect if decided against the Company. On November 22, 2002, our common stock began trading on The Nasdaq Global Market System (“Nasdaq”) under the symbol “COSI.” The closing price of our common stock on Nasdaq was $ 2.60 on March 19, 2015. On August 22, 2014, the Company sold 3,367,874 unregistered shares of the Company’s common stock, par value of $0.01 per share, at a purchase price of $1.15 per share to Plaisance Fund, LP, a fund managed by Janus Capital Management LLC, for gross proceeds of $3.9 million and concurrently therewith sold 521,739 unregistered shares of the Company’s common stock, par value of $0.01 per share, at a purchase price of $1.15 per share, to Lloyd I. Miller Trust C for gross proceeds of $.6 million. On April 14, 2014, the Company entered into a $5.0 million Senior Secured Promissory Note Agreement with MILFAM II L. P. (the “MILFAM Note” and the “MILFAM Note Agreement”, respectively). The MILFAM Note bears interest at nine percent (9%) per annum, compounded semi-annually, and payable in arrears on a semi-annual basis. At the Company’s option, the first two semi-annual interest payments may be paid at eleven percent (11%) in kind in the form of additional promissory notes. The principal obligations under the MILFAM Note are due three (3) years from the effective date of the MILFAM Note. The MILFAM Note Agreement provided for the payment of a finance fee of 3.5% of the principal amount of the MILFAM Note at closing as well as providing a warrant exercisable to purchase up to 1.1 million shares of the Company’s common stock at an exercise price per share of $0.01. The warrant would not be exercisable to the extent that doing so resulted in MILFAM and any related parties, in the aggregate, owning more than 19.9% of the Company’s common stock. Further, until all of the obligations under the MILFAM Note are paid in full, MILFAM will have the right to participate in any future financing transactions consummated by the Company in an amount up to the greater of (1) the then-outstanding balance of obligations under the MILFAM Note and (2) $4.0 million. The MILFAM Note is guaranteed by the Company’s subsidiaries and secured by a lien on all assets of the Company and its subsidiaries [but excluding the assets of Hearthstone Associates, LLC, and Hearthstone Partners, LLC]. Mr. Lloyd I. Miller, III, is the manager of MILFAM LLC, which is the general partner of MILFAM. Mr. Miller is a significant shareholder of the Company. As of the issuance date, the relative value of the warrants was $1.0 million, which was the amount recorded as debt discount, with an offset to additional paid-in capital. The debt discount will be amortized over the life of the MILFAM Note, three years, and charged to interest expense using the effective interest rate calculation method. During Fiscal 2014, we chose the PIK option on the first interest payment which was due on October 14, 2014. On May 20, 2014, the Company entered into a $2.5 million Senior Secured Note Purchase Agreement with AB Opportunity Fund LLC and AB Value Partners, L.P. (the “AB Notes”, the “AB Note Agreement”, and the “AB Entities”, respectively). The AB Notes are payable in full on the third anniversary from the effective date of the AB Notes. Interest will accrue at the rate of nine percent (9%), compounded semi-annually, and will be paid in arrears semi-annually, provided that the Company, at its option, may elect to pay the first two semi-annual interest payments at a rate of eleven percent (11%) in kind in the form of additional promissory notes. As consideration for the AB Notes, the Company provided a fee of 3.5% of the principal amount of the AB Notes and warrants exercisable to purchase up to an aggregate, initially, of 550,000 shares of the common stock of the Company at an exercise price per share of $.01, provided that the AB Entities would not be permitted to exercise the warrants to the extent such exercise would result in any of the AB Entities and any related parties, in the aggregate, owning more than 19.9% of the Company’s common stock. The warrants were exercisable by the AB Entities at any time prior to the third anniversary from the effective date of the AB Notes, in whole or in part, by surrendering the warrants and a form of exercise to the Company. As of the issuance date, the relative value of the warrants was $0.5 million, which was the amount recorded as debt discount, with an offset to additional paid-in capital. The debt discount will be amortized over the life of the AB Notes, three years, and charged to interest expense using the effective interest rate calculation method. During Fiscal 2014, we chose the PIK option on the first interest payment which was due on December 20, 2014. We incurred approximately $0.5 million of debt issuance costs in connection with the issuance of both senior secured promissory notes issued during FY 2014 and are in compliance with all covenant requirements under the MILFAM and AB Note Agreements. On December 23, 2014, we completed a shareholders’ rights offering to our shareholders of record as of October 31, 2014. We issued a total of 13,333,329 shares of our common stock, $0.01 par value, at a subscription price of $1.50 per share. We received net proceeds of approximately $19.7 million from the rights offering of common stock which the Company intends to use for general corporate purposes, which may include, but are not limited to, funding our growth plan, working capital and capital expenditures, such as initiatives to propel sales growth in our restaurants, investing in technology, including remote ordering, POS system upgrade, and initiatives to increase through-put efficiencies; upgrading equipment and furnishings, and refreshing our restaurants; and, funding our operations. We may also use proceeds from the rights offering to pay down debt. A portion of the funds was used for construction of a new restaurant in Chicago that opened in December of 2014. Set forth below are the high and low closing sale prices for shares of our common stock for each quarter during fiscal 2014 and 2013 as reported by Nasdaq. The number of our registered common stockholders of record as of February 26, 2015, was 53. This number excludes stockholders whose stock is held in nominee or street name by brokers. We have never paid cash dividends on our common stock, and we do not currently intend to pay any dividends. The information relating to securities authorized for issuance under our equity compensation plans is disclosed in Item 12 “Security Ownership of Certain Beneficial Owners and Management and Related Stockholder Matters”. 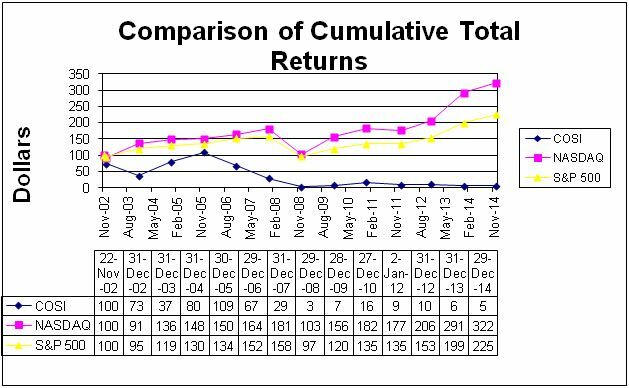 Set forth below is a graph comparing the cumulative total stockholder return on Così common stock with The Nasdaq Composite Index and the Standard & Poor’s Small Cap 600 Index for the period covering our initial public offering on November 22, 2002, through the end of our 2014 fiscal year on December 29, 2014. The Company’s common stock trades on The Nasdaq Capital Market under the symbol “COSI.” The graph assumes an investment of $100.00 made at the opening of trading on November 22, 2002, in (i) Così common stock, (ii) the stocks comprising The Nasdaq Composite Index, and (iii) stocks comprising the Standard & Poor’s Small Cap 600 Index. The following table sets forth our summary of selected consolidated financial data, which should be read in conjunction with “Management’s Discussion and Analysis of Financial Condition and Results of Operations” and our audited consolidated financial statements and the related notes included elsewhere in this report. The selected statement of operations data for fiscal years 2014, 2013, and 2012, and selected balance sheet data for fiscal years 2014 and 2013, are derived from our audited consolidated financial statements that are included in this report. The selected statement of operations data for fiscal years 2011 and 2010, and selected balance sheet data for fiscal years 2012, 2011, and 2010, are derived from our audited consolidated financial statements not included in this report. The following historical results of consolidated operations are not necessarily indicative of results to be expected for any subsequent period. The following discussion and analysis of our financial condition and results of operations for the fiscal years ended December 29, 2014, December 30, 2013, and December 31, 2012, should be read in conjunction with “Selected Consolidated Financial Data” and our audited consolidated financial statements and the notes to those statements that are included elsewhere in this Annual Report. Our discussion contains forward-looking statements based upon current expectations that involve risks and uncertainties, such as our plans, objectives, expectations and intentions. Actual results and the timing of events could differ materially from those anticipated in these forward-looking statements as a result of a number of factors, including those set forth under “Cautionary Note Regarding Forward-Looking Statements” below and elsewhere in this Annual Report. As of December 29, 2014, there were 64 Company-owned and 47 franchised Cosi® restaurants operating in 16 states, the District of Columbia, the United Arab Emirates, and Costa Rica. During fiscal 2014, we closed ten Company-owned restaurants, three in Pennsylvania, two in each of Maryland, Illinois and Virginia, and one in Connecticut. During the same period, we opened one new and converted three franchised restaurants to Company-owned. Two franchised restaurants opened, one in Costa Rica and one in Boston, and permanently closed four franchised locations during fiscal 2014. Our restaurants offer innovative, savory, made-to-order products featuring our authentic hearth-baked crackly-crust signature Cosi® bread and fresh distinctive ingredients. We maintain a pipeline of new menu offerings that are introduced seasonally through limited time offerings to keep our products relevant to our target customers. Our menu features high-quality, made-to-order hot and cold sandwiches, hand-tossed salads, bowls, breakfast wraps, Cosi® Squagels®, melts, flatbread pizzas, S’mores, chia shots and other desserts, and a variety of coffees, along with other soft drink beverages, bottled beverages, including premium still and sparkling waterS, teas, alcoholic beverages, and other specialty coffees and beverages. Our restaurants offer lunch and afternoon coffee in a counter-service format, with most offering breakfast and/or dinner and dessert menus as well. We are currently eligible to offer franchises in 47 states and the District of Columbia. We offer franchises to area developers and individual franchise operators. The initial franchise fee, payable to us, for both an area developer and an individual franchise operator, is $40,000 for the first restaurant and $35,000 for each additional restaurant. We believe that incorporating a franchising and area developer model into our strategy will position us to maximize the market potential for the Cosi® brand and concept consistent with our available capital, and we expect that Company-owned restaurants (restaurants that we own as opposed to franchised restaurants) will always be an important part of our new restaurant growth. We also continue to explore strategic opportunities with our Cosi Pronto® (our grab-and-go concept) and full-service concepts in educational establishments, airports, train stations, museums, medical facilities and other public venues that meet our operating and financial criteria. Our discussion and analysis of our consolidated financial condition and results of operations is based upon the consolidated financial statements and notes to the consolidated financial statements, which have been prepared in accordance with accounting principles generally accepted in the United States of America (“GAAP”). The preparation of the consolidated financial statements requires us to make estimates, judgments and assumptions that affect the reported amounts of assets and liabilities and disclosure of contingent assets and liabilities at the date of the financial statements and the reported amounts of revenue and expenses during the reporting period. We believe the application of our accounting policies, and the estimates inherently required therein, are reasonable and generally accepted for companies in the restaurant industry. We believe that the following addresses the more critical accounting policies used in the preparation of our consolidated financial statements and requires management’s most difficult and subjective judgments, often as a result of the need to make estimates about the effect of matters that are inherently uncertain. There have been no material changes in the application of our most critical accounting policies and estimates, judgments and assumptions during fiscal 2014. Long Lived Assets: ASC 360-10-35 Property, Plant, & Equipment requires management judgments regarding the future operating and disposition plans for marginally-performing assets, and estimates of expected realizable values for assets to be sold. The application of this standard has affected the amount and timing of charges to operating results that have been significant in recent years. We evaluate possible impairment at the individual restaurant level periodically and record an impairment loss whenever we determine impairment factors are present. We consider a history of poor financial operating performance to be the primary indicator of potential impairment for individual restaurant locations. We determine whether a restaurant location is impaired based on expected undiscounted cash flows, generally for the remainder of the lease term, and then determine the impairment charge based on discounted cash flows for the same period. Restaurants are not considered for impairment during the “ramp-up” period before they enter the comparable restaurant base, unless specific circumstances warrant otherwise. If a restaurant location is not reaching their expected sales, impairment maybe a possibility in the near future. Lease Termination Charges: ASC 420-10-30 Exit or Disposal Cost Obligations requires companies to recognize a liability for the costs associated with an exit or disposal activity when the liability is incurred, rather than at the time of a commitment to an exit or disposal plan. For all exit activities, we estimate our likely liability under contractual leases for restaurants that have been closed. Such estimates have affected the amount and timing of charges to operating results and are impacted by management’s judgments about the time it may take to find a suitable subtenant or assignee, or the terms under which a termination of the lease agreement may be negotiated with the landlord. Stock-Based Compensation Expense: In accordance with ASC 718-10-25 Compensation – Stock Compensation, we recognize stock-based compensation expense according to the fair value recognition provision, which generally requires, among other things, that all employee share-based compensation is measured using a fair value method and that all the resulting compensation expense be recognized in the financial statements. We measure the estimated fair value of our granted stock options using a Black-Scholes pricing model and of our restricted stock based on the fair market value of a share of registered stock on the date of grant. The weighted average fair values of the stock options granted through 2013, the last time we issued stock options, were determined using the Black-Scholes option-pricing model. Restaurant Net Sales. Our Company-owned restaurant sales are composed almost entirely of food and beverage sales. We record revenue at the time of the purchase of our products by our customers. Franchise Fees and Royalties. Franchise fees and royalties includes fees earned from franchise agreements entered into with area developers and franchise operators, as well as royalties received based on sales generated at franchised restaurants. We recognize the franchise fee in the period in which a franchised restaurant opens or when fees are forfeited as a result of a termination of an area developer agreement. We recognize franchise royalties in the period in which sales are made by our franchise operators. Gift Card Sales. We offer our customers the opportunity to purchase gift cards at our restaurants and through our website. Customers can purchase these cards at varying dollar amounts. At the time of purchase by the customer, we record a gift card liability for the face value of the card purchased. We recognize the revenue and reduce the gift card liability when the gift card is redeemed. We do not reduce our recorded liability for potential non-use of purchased gift cards. In calculating comparable restaurant sales, we include a restaurant in the comparable restaurant base after it has been in operation for 15 full months. We remove from the comparable restaurant base for the period any restaurant that is temporarily shut down for remodeling during that period. At fiscal years ended December 29, 2014, December 30, 2013, and December 31, 2012, there were 60, 70, and 75 restaurants in our comparable restaurant base, respectively. General and Administrative Expenses. General and administrative expenses include all corporate and administrative functions that support our restaurants and provide an infrastructure to operate our business. Components of these expenses include executive management costs; supervisory and staff salaries; non-field stock-based compensation expense; non-field bonuses and related taxes and employee benefits; travel; information systems; training; support center rent and related occupancy costs; and, professional and consulting fees. The salaries, bonuses and employee benefits costs included in general and administrative expenses are generally more fixed in nature and do not vary directly with the number of restaurants we operate. Stock-based compensation expense includes the charges related to recognizing the fair value of stock options and restricted stock as compensation for awards to certain key employees and non-employee directors, except the costs related to stock-based compensation for restaurant employees which are included in restaurant labor and related benefits. Restaurant Pre-opening Expenses. Restaurant pre-opening expenses are expensed as incurred and include the costs of recruiting, hiring and training the initial restaurant work force, travel, the cost of food and labor used during the period before opening, the cost of initial quantities of supplies and other direct costs related to the opening or remodeling of a restaurant. Pre-opening expenses also include rent expense recognized on a straight-line basis from the date we take possession through the period of construction, renovation and fixturing prior to opening the restaurant. Hearthstone Merger. On March 18, 2014, we entered into an Election to Cause Merger Agreement (the “Hearthstone Agreement”) with Hearthstone Associates, LLC (“Hearthstone Associates”), Robert J. Dourney and Nancy Dourney (we refer to Nancy and Robert J. Dourney together as the “Holders”). Hearthstone Associates, which is wholly owned by the Holders, operates certain Così franchise restaurants through its wholly-owned subsidiary, Hearthstone Partners, LLC, a Massachusetts limited liability company (the “Hearthstone Subsidiary”). The Hearthstone Agreement was entered into in connection with Mr. Dourney’s appointment as our President and Chief Executive Officer. On January 2, 2015, [Hearthstone Associates] notified us that we would be required to effect the Hearthstone Merger. We expect to close the Hearthstone Merger in the second quarter of 2015, subject to receipt of certain lender consents of Hearthstone Associates and satisfaction of other customary conditions. FFCC has agreed to provide its consent to the Merger on the condition that the Company deposit $5,000,000 (“Cash Collateral”) to FFCC to secure Hearthstone Partner’s remaining obligations under the FFCC Notes. The Cash Collateral would remain in a control account until FFCC determines, in its sole discretion that the indebtedness is adequately supported by the financial performance of the Company, or the indebtedness due to FFCC is paid in full. As the outstanding balance under the FFCC Notes is reduced, the Company may request once annually that the Cash Collateral be ratably reduced. As a further condition, the Company has agreed to the obligations of Hearthstone Partners under the FFCC Notes. Restaurant net sales decreased by approximately $8.4 million, or 10.1%, during fiscal 2014, as compared to fiscal 2013, due to a $7.9 million decrease in net sales related to closing 10 Company-owned restaurants during fiscal 2014 and approximately $3.5 million, or 4.7%, decrease in net sales in our comparable restaurant base, partially offset by $3.0 million in sales from the conversion of 3 franchised restaurants to Company owned and 1 new restaurant opening. The decrease in comparable net sales was comprised of 5.1% decrease in traffic, partially offset by 0.4% increase in average check. Franchise Fees and Royalties: Franchise fees and royalties decreased by approximately $0.1 million, or 4.6%, during fiscal 2014, due to a decrease of approximately $0.1 million in royalties from the permanent closing of 3 franchised restaurants and the conversion of 3 franchised restaurants to Company-owned, partially offset by franchise fees from the opening of two new franchised restaurants during fiscal 2014. Cost of Food and Beverage: The increase in cost of food and beverage, as a percentage of restaurant net sales, is primarily due to higher food costs, including, but not limited to, increases in the costs of poultry, dairy, shredded lettuce, tomatoes, specialty desserts and new product offerings. Restaurant Labor and Related Benefits: Restaurant labor and related benefits, as a percentage of restaurant net sales, is relatively flat due primarily to the favorable impact from the adjustments to restaurant management staffing levels at certain locations during the year. The cost of healthcare-related benefits was also lower during fiscal 2014, as compared to the prior year. Occupancy and Other Restaurant Operating Expenses: The increase in occupancy and other restaurant operating expenses, as a percentage of restaurant net sales, is due primarily to the unfavorable effect on fixed occupancy-related costs of the decrease in comparable net restaurant sales, more expensive lease and higher operating costs of existing Company-owned restaurants. General and Administrative Expenses: The increase in general and administrative expenses is due primarily to charges of approximately $1.3 million resulting from the relocation of the corporate headquarters from Chicago, Illinois, to Boston, Massachusetts, including termination of the corporate office lease, severance pay and recruiting fees, as well as higher legal fees incurred in the quarter, partially offset by labor and related benefits savings resulting from administrative workforce reductions effected during 2013, prototype design costs incurred during 2013, as well as lower year-over-year costs for corporate insurance and forfeited amortized restricted stock compensation expense during fiscal 2013. Depreciation and Amortization: The dollar decrease in depreciation and amortization expenses was due to the impact of impairments of approximately $1.0 million recorded during and subsequent to the first quarter of fiscal 2013, as well as the continued depreciation of our comparable restaurant base. Restaurant Pre-opening Expenses: The restaurant pre-opening expenses are related to the relocation of one Company-owned restaurant during fiscal 2014 and 2013. Provision for Losses on Asset Impairments and Disposals: We recorded a provision for losses on asset impairments and disposals of approximately $0.4 million, related to the disposals of assets at 10 Company-owned restaurants at the termination of their leases in fiscal 2014. During fiscal 2013, we recorded a provision for losses on asset impairments and disposals of approximately $1.1 million related to 6 underperforming restaurants. Closed Store Costs: The closed store costs resulted from the closing of Company-owned restaurants during fiscal 2014 and 2013. Lease Termination Expense/(Income), net: The increase in lease termination expense is primarily related to the closing of 10 Company-owned restaurants in fiscal 2014 totaling approximately $1.2 million resulting from the continued assessment of our restaurant portfolio. Gain on Sale of Assets: The gain on sale of assets is related to the sale of a liquor license during each of fiscal 2014 and 2013. Interest Expense: We incurred interest expense in fiscal 2014 related to obligations on senior secured promissory notes. Debt Issuance Amortization: Debt issuance amortization relates to the amortization associated with the discount on the senior secured promissory notes issued in FY 2014. Other Income: Other income is primarily due to the discounting of the long-term portion of a note receivable in fiscal 2014. Net Loss and Comprehensive Loss: The increase in the net loss and comprehensive loss of $5.2 million in fiscal 2014 is due to $2.0 million of negative restaurant cash flow driven by the decrease in restaurant net sales, one-time charges of $1.5 million in lease termination expenses, $1.3 million for the relocation of the corporate headquarters to Boston, Massachusetts offset by a $0.6 million reduction in provisions for asset impairments, $0.4 million of debt issuance amortization, $0.5 million of interest expense recorded on long-term debt and $0.1 million in costs related to Company-owned store closures. Restaurant net sales decreased by approximately $11.4 million, or 12.1%, during fiscal 2013, as compared to fiscal 2012, due to an approximately $6.9 million decrease in net sales related to Company-owned restaurants closed during and subsequent to the first quarter of fiscal 2012 and an approximately $4.5 million, or 5.1%, decrease in net sales in our comparable restaurant base. The decrease in comparable net sales was comprised of 6.5% decrease in traffic, partially offset by 1.4% increase in average check. Franchise Fees and Royalties: Franchise fees and royalties decreased by approximately $0.2 million, or 6.4%, during fiscal 2013, due to approximately $0.2 million in franchise fees recognized during fiscal 2012 resulting from a cancelled area development agreement and a decrease of approximately $0.1 million in royalties from the closing of franchised restaurants during and subsequent to the first quarter of fiscal 2012, partially offset by approximately $0.1 million in franchise fees from the opening of four new franchised restaurants during fiscal 2013. Cost of Food and Beverage: The increase in cost of food and beverage, as a percentage of restaurant net sales, is largely due to a shift in day-part sales and menu mix towards products with higher food costs, as a percentage of sales, as well as the impact of higher costs for the seasonal limited time offer promotional items, when compared to the items promoted during fiscal 2012. Also driving the increase in cost of food and beverage, as a percentage of restaurant net sales, is the introduction of a new product line of bowls in 2013 which, as a category, has a higher cost of goods as a percentage of net sales than our other entrée categories. Beverage sales, primarily fountain drinks and coffee, which historically have a lower average cost than non-beverage product offerings, declined during the 2013 fiscal year. We also experienced some higher costs of certain commodities, such as produce and poultry, during the first half of 2013. Restaurant Labor and Related Benefits: The increase in restaurant labor and related benefits in fiscal 2013, as a percentage of net sales, is due primarily to the unfavorable impact on labor from the decrease in comparable net restaurant sales, primarily the impact on the fixed-portion of manager labor as well as to the deployment of additional hourly labor, primarily in the latter half of the year, as part of an initiative to improve guest experience and speed of service. The cost of healthcare-related benefits was also higher during fiscal 2013, as compared to the prior year. Occupancy and Other Restaurant Operating Expenses: The increase in occupancy and other restaurant operating expenses in fiscal 2013, as a percentage of restaurant net sales, is due primarily to the unfavorable effect on fixed occupancy-related costs of the decrease in comparable net restaurant sales, higher costs for repairs and maintenance of existing Company-owned restaurants, and the increase in paper and packaging costs resulting from a year-over-year increase in catering sales. General and Administrative Expenses: The slight increase in general and administrative expenses in 2013 is due primarily to the charge of approximately $0.6 million for severance pay resulting from administrative workforce reductions during fiscal 2013, as well as the approximately $0.5 million charge to reserve a note receivable from a franchisee, partially offset by labor savings from the administrative workforce reductions, lower expenses for third-party professional fees, and the costs of certain relocation expenses incurred during fiscal 2012. Depreciation and Amortization: The decrease in depreciation and amortization expenses in fiscal 2013 is due primarily to the continued depreciation of our comparable restaurant base and the impact of asset impairments recorded during and subsequent to fiscal 2012. Restaurant Pre-opening Expenses: The restaurant pre-opening expenses in fiscal 2013 are related to the relocation of one Company-owned restaurant during fiscal 2013. Provision for Losses on Asset Impairments and Disposals: We recorded an impairment loss of approximately $1.0 million during fiscal 2013, as well as a loss of approximately $0.1 million from the disposal of assets related to the closing of Company-owned restaurants. Closed Store Costs: The closed store costs in fiscal 2013 resulted from the closing of Company-owned restaurants at the expiration of their leases. Lease Termination Expense/(Income), net: The lease termination expense during fiscal 2013 is related to the closing of two Company-owned restaurants, partially offset by an adjustment resulting from the expiration of our obligation under a previously-transferred lease agreement. Gain on Sale of Assets: The gain on sale of assets is related to the sale of a liquor license during fiscal 2013. Other Income: Other income in fiscal 2013 is primarily due to the discounting of the long-term portion of a note receivable. Net Loss and Comprehensive Loss: The increase in net loss in fiscal 2013 is due primarily to the unfavorable effect of the decrease in comparable restaurant net sales on the fixed-portion of occupancy-related costs and manager labor, the increase in food and beverage and paper and packaging costs, the increase in the provision for asset impairments, the charge for severance pay, the reserve on a note receivable, and the net impact of locations closed during and subsequent to the first quarter of fiscal 2012, partially offset by lower depreciation expense, savings realized from the administrative workforce reductions, savings in third-party professional fees, and lower costs for marketing materials and advertising media expense. On April 14, 2014, the Company entered into a $5.0 million Senior Secured Promissory Note Agreement with MILFAM II L. P. (the “MILFAM Note” and the “MILFAM Note Agreement”, respectively). The MILFAM Note bears interest at nine percent (9%) per annum, compounded semi-annually, and payable in arrears on a semi-annual basis. At the Company’s option, the first two semi-annual interest payments may be paid at eleven percent (11%) in kind in the form of additional promissory notes. The principal obligations under the MILFAM Note is due three (3) years from the effective date of the MILFAM Note. The MILFAM Note Agreement provided for the payment of a finance fee of 3.5% of the principal amount of the MILFAM Note at closing as well as providing a warrant exercisable to purchase up to 1.1 million shares of the Company’s common stock at an exercise price per share of $0.01. The warrant would not be exercisable to the extent that doing so resulted in MILFAM II and any related parties, in the aggregate, owning more than 19.9% of the Company’s common stock. Further, until all of the obligations under the MILFAM Note are paid in full, MILFAM will have the right to participate in any future financing transactions consummated by the Company in an amount up to the greater of (1) the then-outstanding balance of obligations under the MILFAM Note and (2) $4.0 million. The MILFAM Note is guaranteed by the Company’s subsidiaries and secured by a lien on all assets of the Company and its subsidiaries. Mr. Lloyd I. Miller, III, is the manager of MILFAM LLC, which is the general partner of MILFAM. Mr. Miller is a significant shareholder of the Company. On September 16, 2014, 1.1 million of the warrants provided under the MILFAM Note Agreement were exercised in order to purchase 1.1 million unregistered shares of the Company’s common stock at an exercise price of $0.01 per share, resulting in an aggregate purchase price of $11,000. During Fiscal 2014, we chose the PIK option on the first interest payment which was due on October 14, 2014. On May 20, 2014, the Company entered into a $2.5 million Senior Secured Note Purchase Agreement with AB Opportunity Fund LLC and AB Value Partners, L.P. (the “AB Notes”, the “AB Note Agreement”, and the “AB Entities”, respectively). The AB Notes are payable in full on the third anniversary from the effective date of the AB Notes. Interest will accrue at the rate of nine percent (9%), compounded semi-annually, and will be paid in arrears semi-annually, provided that the Company, at its option, may elect to pay the first two interest payments at a rate of eleven percent (11%) in kind in the form of additional promissory notes. As consideration for the AB Notes, the Company provided a fee of 3.5% of the principal amount of the AB Notes and warrants exercisable to purchase up to an aggregate, initially, of 550,000 shares of the common stock of the Company at an exercise price per share of $.01, provided that the AB Entities shall not be permitted to exercise the warrants to the extent such exercise would result in the AB Entities and any related parties, in the aggregate, owning more than 19.9% of the common stock of the Company. The warrants are exercisable by the AB Entities at any time prior to the third anniversary from the effective date of the AB Notes, in whole or in part, by surrendering the warrants and a form of exercise to the Company. On October 14, 2014, 550,000 of the warrants provided under the AB Note Purchase Agreement were exercised by the cashless exercise method. During Fiscal 2014, we chose the PIK option on the first interest payment which was due on December 20, 2014. On August 22, 2014, the Company sold 3,367,874 unregistered shares of the Company’s common stock, par value of $0.01 per share, at a purchase price of $1.15 per share, to Plaisance Fund, LP, a fund managed by Janus Capital Management LLC, for gross proceeds of $3,873,055, and concurrently therewith sold 521,739 unregistered shares of the Company’s common stock, par value of $0.01 per share, at a purchase price of $1.15 per share to Lloyd I. Miller Trust C for gross proceeds of $600,000. On December 23, 2014, the Company completed a shareholders’ rights offering to our shareholders of record as of October 31, 2014. The Company issued a total of 13,333,329 shares of our common stock, $0.01 par value, at a subscription price of $1.50 per share. The Company received net proceeds of approximately $19.7 million from the rights offering of common stock which the Company intends to use for growth and general corporate purposes, which may include, but are not limited to, funding our growth plan, working capital and capital expenditures, such as initiatives to propel sales growth in our restaurants, investing in technology, including remote ordering, POS system upgrade, and initiatives to increase through-put efficiencies; upgrading equipment and furnishings, and refreshing our restaurants; and, funding our operations. We may also use proceeds from the rights offering to pay down debt. A portion of the funds was used for construction of a new restaurant in Chicago that opened in December of 2014. Cash and cash equivalents were approximately $21.6 million on December 29, 2014, compared with $6.0 million on December 30, 2013. We had positive working capital of approximately $14.1 million on December 29, 2014, compared with negative working capital of $2.5 million on December 30, 2013. The increase in working capital is primarily due to the proceeds from the shareholder rights offering, senior secured notes and private placements for the sale of unregistered shares of the Company’s common stock, $0.01 par value. Our principal requirements for cash in 2015 will be for refreshing our restaurants, investment in technology, pay down of debt and working capital. Net cash used in operating activities during fiscal 2014 was approximately $13.9 million compared with $7.3 million during fiscal 2013. The $6.6 million increase in use of cash was primarily the result of the $5.2 million higher operating loss, $1.4 million pay down on vendor payables and other liabilities, partially offset by higher depreciation and other non-cash expenses. Net cash used in investing activities during fiscal 2014 was approximately $1.8 million compared with net cash used in fiscal 2013 of approximately $2.1 million and was primarily the result of $1.1 million for capital expenditures relating to the maintenance of existing Company-owned restaurants, $0.5 million for a new Company-owned restaurant developed in Chicago, Illinois, and $0.2 million for certain information technology related projects. Cash provided by financing activities during fiscal 2014 of approximately $31.3 million included $19.7 million from proceeds associated with the shareholder rights offering, $7.6 million from senior secured promissory notes and $4 million from stock purchase agreements. No cash was provided by financing activities in fiscal 2013. During fiscal 2014, four quarterly payments of $62,500 each were not paid to the Company as scheduled in accordance with the terms of the Subordinated Secured Promissory Note associated with the sale of restaurants to a franchisee in 2010. Although still uncertain as to timing, the Company expects the franchisee to satisfy its obligations under the Subordinated Secured Promissory Note which currently has an outstanding balance of $1 million. As of December 29, 2014, the Company has established a reserve of $0.5 million for the Subordinated Secured Promissory Note. During fiscal 2015, we expect to invest in initiatives that will increase throughput efficiencies and that will propel sales growth. We plan to invest capital to refresh our restaurants, upgrade our POS system, modernize restaurant equipment and furnishings as well as fund our operations. We expect to fund these initiatives with the proceeds from the shareholder rights offering, senior secured promissory notes, private placements from the sale of unregistered shares of the Company’s common stock, cash and cash equivalents on hand, expected cash flows generated by existing Company-owned restaurants, and expected franchise fees and royalties. We believe that our current cash and cash equivalents and the expected cash flows from Company-owned restaurant operations and the expected franchise fees and royalties will be sufficient to fund our cash requirements for working capital needs and capital improvements and maintenance of existing restaurants for the next twelve months. Our conclusion is based on our financial performance during fiscal 2014 and our projected financial performance for 2015. If our Company-owned restaurants do not generate the cash flow levels that we expect, if new franchised restaurants do not open according to our expectations, if we do not generate the franchise fees and royalties that we currently expect, if we incur significant unanticipated cash requirements beyond our normal liquidity needs, or if we experience other unforeseen circumstances then, in order to fund our cash requirements, we may have to effect further labor reductions in general and administrative support functions, seek to sell certain Company-owned locations to franchisees and/or other third parties, seek other sources of financing or take other actions necessitated by the impact of such unanticipated circumstances. There can be no assurance that we will be able to obtain such financing or sell Company-owned locations to franchisees or other third parties or that we will be able to do so in a timely manner and on acceptable terms to meet our requirements. Given the continued instability in the credit and financial markets, it may be difficult for the Company to obtain additional financing and for franchisees to obtain the financing necessary to open restaurants or to acquire Company-owned locations. An inability to access additional sources of liquidity to fund our cash needs could materially adversely affect our financial condition and results of operations. The primary inflationary factors affecting our business are food and labor costs. Some of our food costs are subject to fluctuations in commodity prices. Volatility in the commodity markets such as the poultry, wheat and dairy markets can have an adverse impact on our results from operations. Some of our hourly personnel at our restaurants are paid at rates based on the applicable minimum wage, and increases in the minimum wage will directly affect our labor costs. Many of our leases require us to pay taxes, maintenance, repairs, insurance, and utilities, all of which are generally subject to inflationary increases. Historically, inflation has not had a material impact on our results of operation. See Note 1 to our consolidated financial statements included in Part II, Item 8 of this report for further details or new accounting pronouncements not yet adopted. We caution that any forward-looking statements (as such term is defined in the Private Securities Litigation Reform Act of 1995) contained or incorporated by reference in this Form 10-K and Annual Report or made by our management involve risks and uncertainties and are subject to change based on various important factors, many of which may be beyond our control. Accordingly, our future performance and financial results may differ materially from those expressed or implied in any such forward-looking statements. For these statements, we claim the protection of the safe harbor for forward-looking statements contained in the Private Securities Litigation Reform Act of 1995. Any such forward-looking statements are subject to risks and uncertainties, including, without limitation, those described in Item 1A of this Report. If any of these risks or uncertainties actually occurs, our business, financial condition or operating results could be materially and adversely affected, and the trading price of our common stock could decline. We do not undertake to publicly update or revise our forward-looking statements even if our future changes make it clear that any projected results expressed or implied therein will not be realized. We do not have interest rate risk on our debt, as this rate is a fixed percentage. Our market risk exposures are related to our cash and interest that we may pay on debt. We have no derivative financial commodity instruments. We invest our excess cash in investment grade, highly liquid, short‑term investments. These investments are not held for trading or other speculative purposes. Changes in interest rates affect the investment income we earn on our investments and, therefore, impact our cash flows and results of operations. During fiscal 2014, we held no short-term investments and, as a result, a hypothetical one percentage point interest change from those in effect during fiscal 2014 would not have resulted in a fluctuation of interest income. In fiscal years 2013 and 2012, the interest income we earned was immaterial and we did not have any significant debt. We are exposed to commodity price risks. Many of the ingredients we use to prepare our food, as well as our packaging materials, are commodities or ingredients that are affected by the price of other commodities, exchange rates, foreign demand, weather, seasonality, production, availability, and other factors outside our control. Some of these commodities are purchased under agreements in effect for periods ranging from one month to one year, usually at fixed prices. As a result, we are subject to commodity risk that current market prices may be below our contractual prices. We also purchase certain ingredients at spot prices, as well as prices that are based on specific formulas related to key components within the commodity category, which could adversely affect our operating result in periods of rising commodity or ingredient prices if we choose, for competitive or other reasons, not to increase menu prices at the same rate at which ingredient costs increase, or if menu price increases result in customer resistance. In fiscal 2014, 2013, and 2012, we did not utilize derivative instruments in managing commodity risk. As of the end of fiscal 2014, all of our transactions are conducted, and our accounts are denominated, in U.S. dollars. Accordingly, we are not exposed to foreign currency risk. We have audited the accompanying consolidated balance sheets of Cosi, Inc. as of December 29, 2014 and December 30, 2013 and the related consolidated statements of operations and comprehensive loss, stockholders’ equity, and cash flows for each of the three years in the period ended December 29, 2014. These financial statements are the responsibility of the Company’s management. Our responsibility is to express an opinion on these financial statements based on our audits. In our opinion, the consolidated financial statements referred to above present fairly, in all material respects, the financial position of Cosi, Inc. at December 29, 2014 and December 30, 2013, and the results of its operations and its cash flows for each of the three years in the period ended December 29, 2014, in conformity with accounting principles generally accepted in the United States of America. The accompanying notes are an intergral part of these consolidated financial statements.